Artificial intelligence (AI) has transformed many sectors of the economy and has a particularly significant effect on the delivery of healthcare. What is artificial intelligence anyway, and how will it impact your career in medicine? Google Dictionary defines artificial intelligence as "The theory and development of computer systems able to perform tasks that normally require human intelligence, such as visual perception, speech recognition, decision-making, and translation between languages." Artificial intelligence will have a significant impact on the way that medical professionals train and how they conduct their jobs. It will also provide many career options for information technology (IT) professionals who create and modify artificial intelligence products for the medical industry. The impact on careers for medical professionals will be very significant. There are AI programs and tools - both in use and in development - for diagnostics, imaging, determining treatment, and surgery. However, experts don’t expect artificial intelligence to replace humans. Instead, AI will help medical professionals to carry out their roles in less time and more effectively. The aspect of healthcare delivery in which artificial intelligence will have the most significant impact is in the diagnostic process. In particular, AI will aid in diagnosing complex cases and rare diseases where even the best-trained professionals may be challenged by processing a large number of patient symptoms, lab results, medical histories, diagnostic images, and patient characteristics. AI diagnostic products generate as output disease scenarios that result from the combination of data inputs into the system. For example, only 9% of pancreatic cancer patients live five years after being diagnosed, and the disease is difficult to diagnose early enough for successful surgical treatment. Healthcare IT News reports that Johns Hopkins researchers have learned that with artificial intelligence detection methods, nearly a third of pancreatic cancer cases could be found 4-to-12 months earlier than with traditional diagnostics. Similarly, AI technology is geared to change treatment options and patient survival rates for many different diseases. Healthcare professionals will benefit from intensive training in the use of AI systems to assist with diagnosis. Medical professionals who are open to using technology but who hold a healthy skepticism about its limitations will be best positioned to add value. Doctors must be careful to include all the relevant data regarding a case to achieve the most accurate results. Another area that will have a clinical impact is the processing of research information relevant to medical cases. With the rapid development of medical technology, new research data has been produced at an increasingly rapid rate. Health Equity reports that the amount of information within the medical literature doubles every three years. It is estimated that if physicians wanted to stay completely up-to-date, they should read 29 hours per work day! While that’s obviously not possible, AI applications will enable medical providers to find quickly the most relevant research and current trials that correlate with their patient’s medical situation. 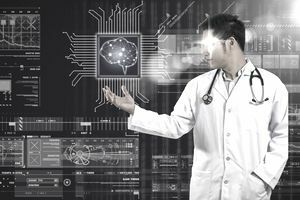 Doctors who tap artificial intelligence systems for updating their professional knowledge will, therefore, have an advantage. According to GE Healthcare, “90% of all healthcare data comes from medical imaging. It’s a lot of information, and more than 97% of it goes unanalyzed or unused.” Artificial intelligence will be a critical factor in managing and analyzing these datasets. AI systems can effectively recognize subtleties in visual images that might suggest various disease scenarios. Bernard Marr in Forbes reports that "Currently, image analysis is very time-consuming for human providers, but an MIT-led research team developed a machine-learning algorithm that can analyze 3D scans up to 1,000 times faster than what is possible today. This near real-time assessment can provide critical input for surgeons who are operating." Radiologists and other doctors who land fellowships and choose employers utilizing the latest AI imaging systems will be in high demand. Medical students should target residencies at robotic surgery centers to develop and enhance their skills. Established surgeons who complete training programs in robotic surgery will be in the best position to take advantage of this trend. Some medical practices offer patients the opportunity to meet with a doctor via a website or by using a mobile app on a tablet or smartphone. For example, UnitedHealthcare covers virtual doctor visits for some types of illnesses. Patients sign up online or download an app to participate, and the appointment takes place by video conferencing. eVisit reports that over half of U.S. hospitals use telemedicine and notes that this shift from in-person to virtual care requires adding new technology, workflows, and patient management systems to healthcare practices. It also provides opportunities for physicians and other providers to work remotely with a flexible schedule. For example, Doctors on Demand offers full-time, seasonal, and part-time flexible positions for physicians, psychologists, and psychiatrists. Medical occupations are consistently included on the lists of the best-paid jobs. Furthermore, TechRepublic reports that the demand for candidates with artificial intelligence skills doubled between 2015 and 2018. Artificial intelligence developers who understand scientific and medical principles, and who gain experience with specialized healthcare AI applications, will be best qualified to excel in this sector. Note: Indeed.com salary information comes from 110,756 data points collected directly from employees, users, and past and present job advertisements on Indeed.com in the past 36 months. What Does a Construction Equipment Operator Do? You Have a Chance to Play a Showcase Gig — Should You Do It?